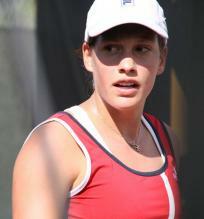 This picture contains pictures of the Canadian woman tennis player Stephanie Dubois. Dubois was born on October 31st, 1986 in Quebec, Canada. Stephanie stands 5'4" and weighs about 128 lbs. She hits from the right side and utilizes a two-handed backhand.